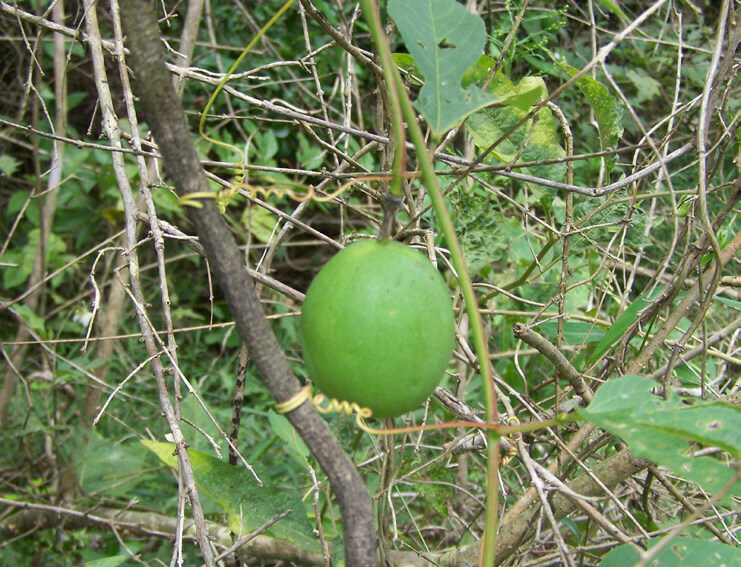 Passionfruit is the edible product of the passionflower vine! 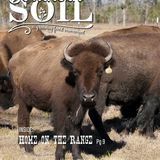 This article is courtesy of the Coast Plain Chapter of the Georgia Native Plant Society. The GNPS is dedicated to promoting the stewardship and conservation of Georgia’s native plants and their habitats. The Coastal Plain Chapter serves the people in the Coastal Plain ecoregion of Georgia. This includes all areas south of the Fall Line in middle Georgia, from the Alabama and Florida borders to the Atlantic ocean. To learn more, please visit their website. Passionflower is one of my favorite vines. 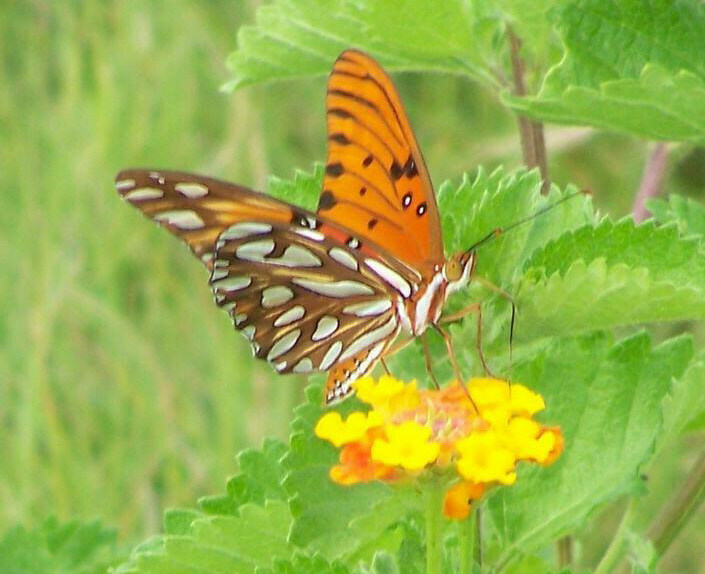 It has interesting leaves, beautiful flowers, and acts as host plant for Gulf Fritillary, Zebra Longwing, Crimson-patch longwing, Red-banded hairstreak, Julia butterfly, Mexican butterfly. In addition, it is a good nectar plant for adult butterflies and other wildlife can eat the fruits. You get a lot of conservation activity from this one plant. As with any perennial vine, it can be a thug in the landscape. Fortunately because it is a host plants for so many butterfly species, you will rarely need to prune it back. Passionflower I have grown has always been covered with gulf fritillary caterpillars. 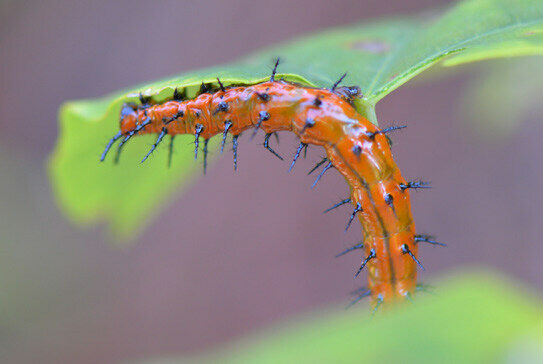 Caterpillars will eat the leaves, flowers, small fruits and tender stems. Passionflower usually grows back very quickly after being pruned by caterpillars. In the landscape, Passionflower can easily be trained on a fence or trellis. Planting it next to a shrub with a short bloom time, gives you more flowers in that space without taking up extra room in the landscape. If it takes a while for the butterflies to find your plant you can pinch them back to encourage a denser growth. It can be propagated from 6-8 inch stem cuttings early in the season. Seed is sometimes difficult to germinate. There are many nonnative species, but the native passionflower is available commercially. 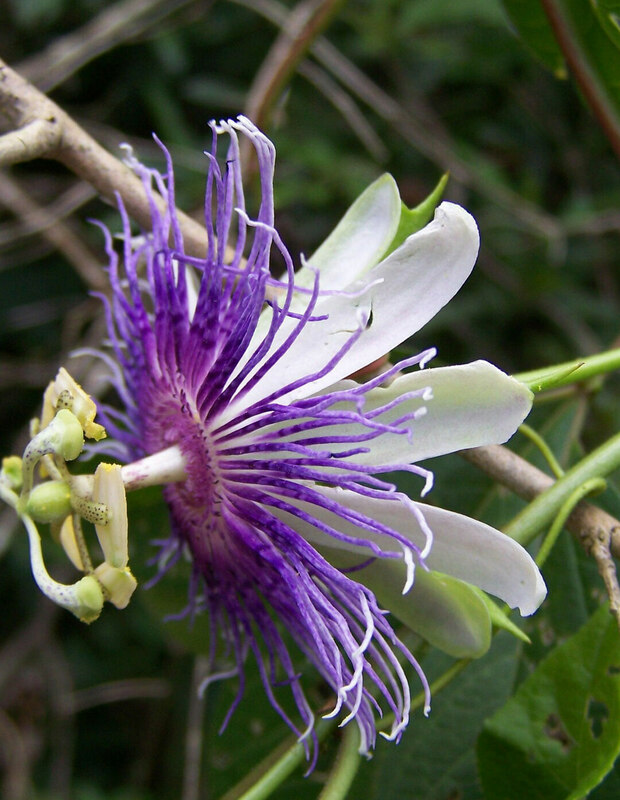 “Passionflowers were named by scholar-priests who accompanied the Spanish Conquistadors. The unusual form of the flowers reminded them of the Crucifixion and the Passion of Christ. The three styles and stigmas in the center represented nails, the 5 stamens beneath them were Christ’s wounds, the fringe was the crown of thorns, and the 10 petals and sepals behind the fringe were the apostles except for Judas and Peter, Biblically, ‘passion’ means suffering” from Horn et al. Wildflowers of Tennessee etc.